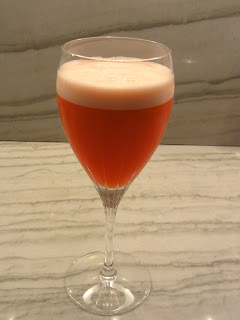 The theme is “morning drinks.” Breakfast cocktails were the norm in the nineteenth century, when cocktails were a common beginning to one’s day. The drink’s purpose was to help the imbiber recover from the past night’s indiscretions and to steel their resolve for the coming day. We’re all familiar with bloody marys, mimosas and bellinis, but what else constitutes a breakfast drink? We’re looking for corpse revivers, eye openers and hair of the dog – drinks that jump start your morning, absolve the prior night’s sins or just taste really good with eggs and bacon. Maybe you like to fortify breakfast smoothies with gin. 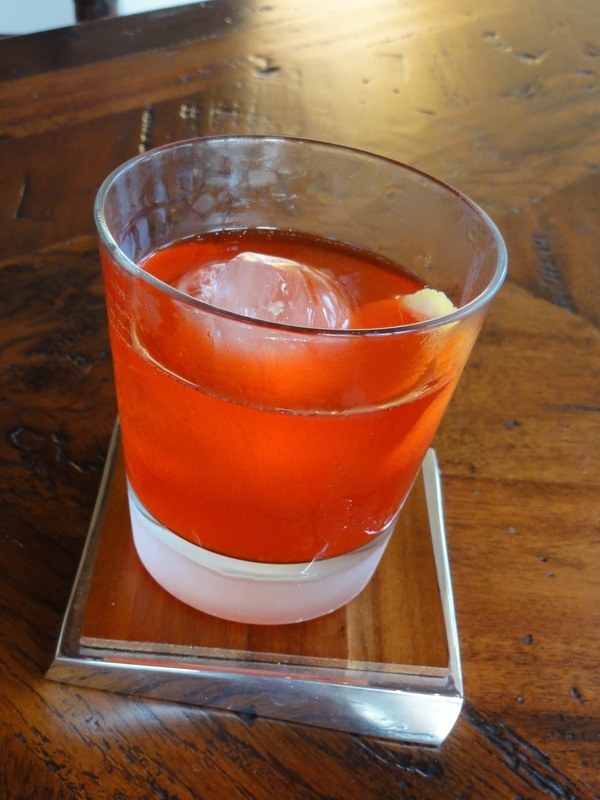 Or perhaps you’ve concocted an alcoholic sangrita that pairs nicely with migas. Regardless, let’s see some morning cocktails...Be as creative as you want, utilizing common breakfast ingredients like orange juice and coffee, or branching out with bacon-infused spirits, eggs or stomach-settling bitters. Well, although it seems like a good time for it, I already used bacon-infused bourbon, maple syrup, cereal-infused milk, and a whole egg in my Breakfast of Champions cocktail back for the Dairy MxMo, so let's see what else I got. I do like the Corpse Reviver. And you know I like stomach-settling bitters, so I think now is the ideal situation to revisit a riff on the Corpse Reviver #2 I have played with before, where I added dashes of Peychaud's bitters in lieu of the absinthe. But what if we step it up a notch and add a full measure of Peychaud's instead of a couple dashes? I'll tell you what happens: we end up in a happy place. So we basically have the equal parts Corpse Reviver #2 recipe, but instead of a dash or rinse of absinthe I've added as much Peychaud's bitters as every other ingredient. I also subbed Cocchi for Lillet, because, well, because I like Cocchi. And I switched out Cointreau for Solerno, because, well, again because I like it, but also because it makes the name even more apt. And as a bonus, I actually think it works a bit better than Cointreau here, as Solerno's flavor is a bit brighter than Cointreau and makes for a marginally lighter drink. Plus it has a pretty bottle, what's not to love? It can be a bit hard to find, so Cointreau works fine if that's what you have. 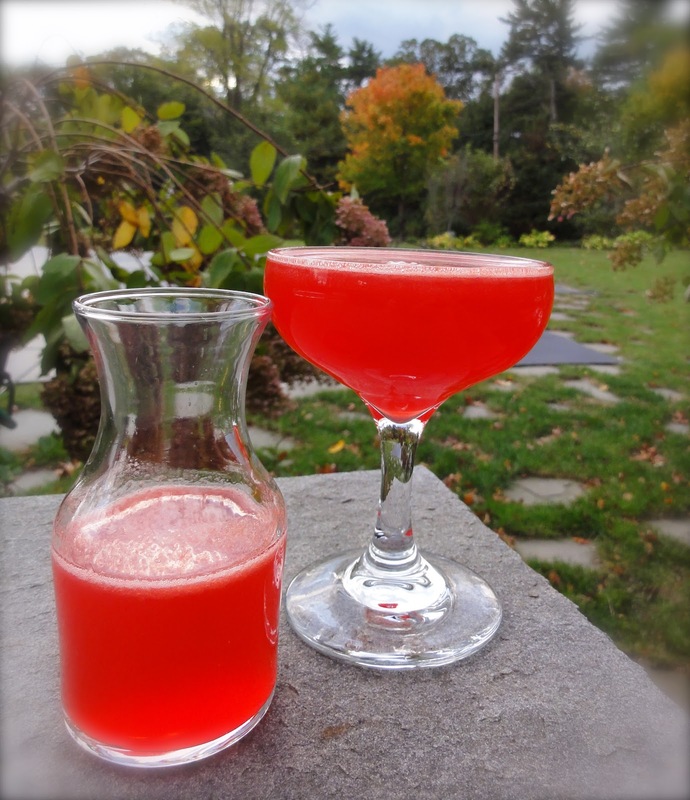 I dubbed the drink Blood Infusion due to the deep red hue from the Peychaud's, the blood orange in the Solerno, as well as to reference the Corpse Reviver upon which it is based. 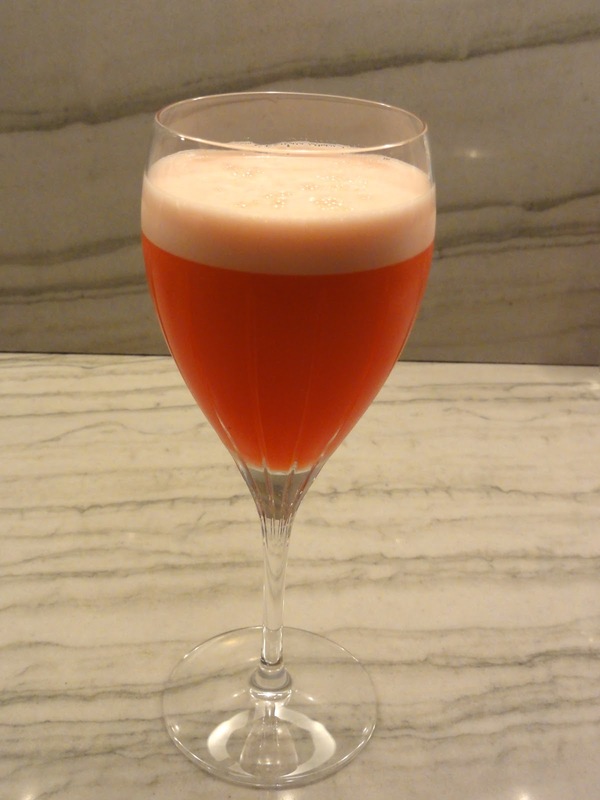 Don't be afraid of the slug of Peychaud's, this drink is nice and refreshing and goes down if anything a bit too easy. n.b. this is the same equal portion recipe as before, I just bumped everything up to a full oz because it's easier to pour ½ oz of the juices than 3/8 oz. I'm sure you can figure out what to do with any extra. Note also I used the larger pour for the above photo and put the leftover as a sidecar in the mini carafe (Libbey 718 3 oz. cocktail decanter). Don't put that bottle of Peychaud's away yet, there's more to come. Is the Blood Infusion too girly for you? Is shaking a drink a bit more than you can handle this morning? Then give this next one a try. Since using a just touch of citrus in bitters heavy cocktails is a technique I've recently become enamored with, let's do another take on a Peychaud's kicked up Corpse Reviver. This drink presents with a lemon aroma from the expressed oils, and upon the sip you are met with the Cointreau's orange flavors, bolstered by the similar notes from the Lillet. The drink finishes with tones of cherry from the Peychaud's with a slightly lingering bitterness. It is not at all harsh, although the bitterness does grow with each sip as the bitter compounds coat your tongue. If the embalmer does not revive you, at the very least it should preserve you. But I'm not done yet. It is morning, right? Gotta have some egg; after all, breakfast is the most important meal of the day. This one is just downright refreshing. The wormwood and orange aromas beckon you to sip, whereupon you will experience all the flavors of the above Corpse Embalmer, though the egg both tempers and bridges the different flavors so they meld and can be tasted all at once, rather than separately first on the sip and later on the finish. Despite it's hot pink coloring, just think of this as a man's mimosa alternative for brunch. Although you should not be brunching, you should be watching football. There you go, three very different Corpse Reviver derivatives, each with a big slug of Peychaud's bitters to settle your stomach on a rough day upon waking. Top o' the morning to you; enjoy. Now I've got to go to the store, as I'm out of Peychaud's. UPDATE: Kevin's roundup post is up, head over there to check out all of this month's morning drinks. That doesn't mean they wouldn't do the trick in the morning. But they'd also be good for an apéritif, or even a digestif in the case of the Embalmer.